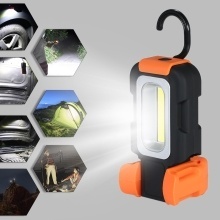 Battery operated LED work light ultra-light, magnetic bottom and hook top make it more convenient for many activities like hiking, fishing, camping, etc. Using LED source, ultra-bright, anti-glare and low power consumption. Widely used for camping, fishing, hiking, cycling, emergency, car repairing, daily work, etc. Compact and ultra light, it weighs less than 3oz, you can place it in car to respond to emergencies or carry it around for many outdoor activities. It has two magnets on the bottom and a folded & 360° rotatable hook on top, can be absorbed on metal surfaces(such as your car) or hung up to free your hands. Made of PVC and PLA, anti-drop, IP65 waterproof protection. Battery operated, powered by 3 * 1.5V AAA batteries. Note: this product is resistant to light rainfall and natural moisture, it is no recommended to use in heavy rain. Don&apos;t put it in water.